I continue to work on TH6 in anticipation of the jump to TH7. 1) Everything new has been purchased and most are at TH5 max levels or upgrading now. I have an AD, AS, and WT left. I elected to get the walls all to level 5 early as well. 2) Lab upgrade was completed; Giants are in the hopper right now. I'll do wallbreakers next, then wizards, balloons, and spells. 3) CC and spell factory are upgrading. Aside from the lab, these are key offensive upgrades. Once the next rounds of upgrades finish, I will start the TH moving to TH7. During those six days, I will continue lab upgrades (spells) and work on resource collectors/storage. Things are a little slower at TH6; it has longer timers to work through. I'll spend about 10 days here though, in all, setting up a good foundation for TH7. Things I am not upgrading right now - defenses to TH6 levels, walls to level 6, and barracks. Defenses aren't very important yet, including walls - I carry very little resources in my storages, instead running an hour long, boosted, raiding session to Fund builders when necessary. And trophies are utterly unimportant at this stage. As to barracks...I have level 7 barracks. This gets me barbarians, archers, goblins, wallbreakers, and Giants...everything I use in my raiding party for TH7 and under. Level 7 barracks are the last, low cost, upgrade; the upgrade to level 8 takes two days and 700K in elixir. That time and those resources are better spent elsewhere. TH6 was fun, but it is now time to say good-bye and move up to TH7. Since moving to TH6 several days back, I've focused on my offense and getting all new items upgraded to the TH5 standard. This has largely been completed. I bought everything and upgraded it all to the same levels of existing structures. Upgrades to TH6 levels were the lab, spell factory, CC (gotta get them 20 troop units), and army camps. An unexpected thing happened - loot suddenly became outstanding late afternoon to early evening. Every raid started pulling in at least 150K+ in gold and elixir, many (most) pulled in 250K+ in each. 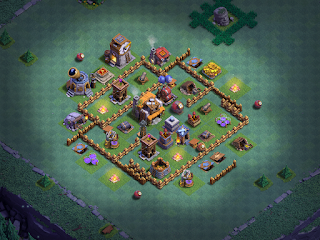 Most bases I saw had 250K/250K/2K (latter being DE for TH7/TH8 bases). So...the raiding madness overpowered me. Three hours later and most of my walls were level 6. Loot has been pretty good lately, but nothing like it was today. I've been going for almost four hours straight now, switching between games. The TH7 upgrade takes 6 days. I will use that time to upgrade my resource collectors a bit further. When I hit TH7, I'll be using my standard upgrade strategy - buy everything new, build a new base, upgrade offense, upgrade defense, upgrade walls. I'll spend a little more time at TH7, though; this is my catch-up TH, where I essentially turn into a maxer for ONE townhall level. Loot at TH7 is pretty good (Silver and Gold leagues, both) and the army composition, once upgraded, is fairly capable. This is the first TH level where players really start saving for bigger upgrades and where the time for upgrades to complete are more than a day; that means there is much more loot available to raid. I take advantage of that, and hang out at TH7 for a few weeks or more before pulling the trigger on the TH8 upgrade. Worth noting - aside from my initial seed gems I bought, I haven’t spent any additional $$$. I’ve been keeping my base clear of debris, catching the occasional gem box, and completing achievements to replenish my gem bank. I picked up the “Sweet Victory” achievement while raiding last night (popped 1250 trophies), and I used 300 of those today boosting barracks and timers. Here's where we are at the end of my TH6 trip. The TH upgrade continues to trudge on. Of course, I can't have the other 4 builders or the lab sitting there idle, so I've kept them busy. The nice thing about TH6 is that upgrades are cheap and loot is easily obtained. I was on some calls today, really boring stuff, so I decided to run a few raids. Filled my storages in no time and started upgrades on 3 archer towers (360k each) and a wizard tower (720k) was already started yesterday. Tomorrow, I'll start the other wizard tower upgrading. I should probably have upgraded my gold mines and elixir collectors, but it's more fun to raid and get defenses cooking. These will likely be the last upgrades at TH6, unless I catch them right when they finish...in which case I'll run the three cannons real quick too. All depends on what's going on Sunday. All told, it was an hour of boosted barracks raiding today. I've switched my army comp up a bit; there's been a lot of really "accessible" base designs up the last couple of days for some reason I cannot fathom, so I just take 9 wallbreakers and a roughly even distribution of archers, barbarians, and goblins. Lots of players running open bases at TH6 and TH7; these are easily overwhelmed. I'm also finding a lot of collector raids this week with 200K/200K or more for the total take. This is all down Silver (I'm Silver I right now). I'm still not buying any gems beyond my initial seed; I just use what I get through achievements, gem boxes, and clearing debris. Got 140 left right now; I will use some of those to boost barracks and raid for an hour just after hitting TH7. My game time has ticked up the last couple of days; whereas I've been putting in 15-20 minutes a day the previous 2 1/2 weeks, I did about 3-4 hours (in total) across the last three days. I just couldn't help myself the other day; the raiding was so good. In my defense, that three hour block of raiding wasn't just spent on this game...I spread it over 5 different games. At any rate, here's the latest stats for anyone still interested. Next update after the TH upgrade finishes.